When We Left the Earth chronicles the Apollo program up until the historic Apollo 11 landing on the moon. 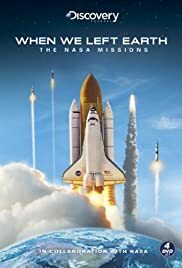 When We Left the Earth examines at the recent shuttle program focusing on the repair of the Hubble Space Telescope, the building of the ISS, and the destruction of the Columbia. When We Left Earth examines the history of American spaceflight starting with the X-15 rocket plane and the Mercury program. The crew members of NASA's Apollo missions tell their story in their own words. With the accolade of flying 24 men to the Moon, the Saturn V will always be considered one of Mankind's greatest technological achievements. This inspirational film reveals the colossal challenges NASA faced to make it fly. An in-depth look at various NASA moon landing missions, starting with Apollo 8. The story leading up to the July 20, 1969, Apollo 11 moon landing launch. When Apollo astronaut Gene Cernan stepped off the moon in December 1972 he left his footprints and his daughter's initials in the lunar dust. Only now is he ready to share his epic but deeply personal story of fulfillment, love, and loss. From outer space countries don't exist. Can't get enough of these historical footage. I can even watch them without a narration, let alone a production this fine. The astronauts are true heroes, one day when humankind sails across the stars, when we settles on a new planet, there will be monuments of these brave souls, that has taken first steps for us.